By Amelia Jo Mitchell Psy D.
We are living in troubled times. Lest we forget, we are bombarded daily with updates and reminders of unemployment, economic worries, threats of terrorism, and war by mass media, political rhetoric, and marketing wizards who are serving their own agendas. As a citizen, mother, and psychologist who has spent hours counseling individuals and couples, I am as concerned as you are. This is not the way humans were meant to live. Evidence abounds in nature, in positive interactions with others, and even in our own bodies, but the messages are subtle, quiet. They are there; we will receive them only if we are receptive to them. I believe that each of us came into the world full of potential and promise-what I call a "love story." What we do with it is our individual choice. 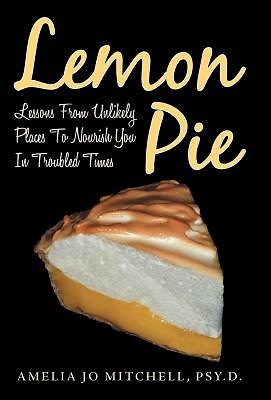 Lemon Pie was written as a reminder of a more joyous way to live and an antidote to messages expounding individualism, greed, and blame. Presented in brief, two- to four-page vignettes, each shares a lesson about compassion, forgiveness, or being our own best friends. Others focus on how we might communicate to feel really heard and the little miracles that occur when we listen with our hearts as well as our ears. Although there are discrete messages in each story, the themes of responsibility and self-ownership appear over and over again, for each of us was given just one life to nurture. How we share it determines the world in which we live and what we pass on to future generations. Lemon Pie invites you to reconsider your own life lessons, so when you lay your head down at night, you can say with a sigh, "I am content." Author: Amelia Jo Mitchell Psy D.